A trip to the Northern Territory. Part 13. You may have guessed from the last post or even from the heading above that our trip to the Northern Territory was drawing to a close. In some ways it was good to think that we would be home soon because really deep down at the bottom of your hearts there is no place like ‘HOME’. This old saying(if that’s what it is) is so true on so many levels it’s not funny! In other ways it was sad to be leaving the Territory, this natural beating heart of Australia Its grandeur, its beauty, its harshness, its isolation, its story, its cultural significance and many more its. We have only seen but a portion of it. Our last day here dawned bright and clear albeit slightly chilly. We were of to have a camel ride! These animals having been introduced to Australia, certainly have taken a likening to the Outback and many thousands, roughly 300,000(2013 estimates after a cull which started in 2009, which estimated there to be 600,000 in 2009) roam the outback. Apparently we are the only country in the world with feral herds of camels and the largest populations of them, seriously?? Here’s a few lined up ready to go on some long tours, we were only going to do the 20 minute version. 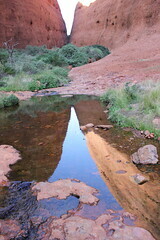 Old Tom’s waterhole, not sure who old Tom is. You can see our rig in the car park all packed and ready to head south(home). getting up close with our ride! Here we go! Time to head towards the Stuart Highway and start our 2,381 kilometre journey home! A far too common sight on the side of the Stuart Highway. Rolled and crashed vehicles, obviously too expensive to retrieve out here, wont be long and they will be scavenged and rusted away in this harsh landscape. Another common sight is road trains, the lifeblood of the outback! Click HERE for some interesting information on road trains. A couple more photos of these largish trucks!. Not real great fun overtaking them either as you watch the individual trailers moving around! We were heading for Marla, 5ookm away in South Australia, our first stop on the way home. When we set up camp behind the Road House we realised there were seven of us instead of the usual six. We had picked up a hitch hiker! Poor little fellow, thought he might like a holiday, we caught him and placed him on the side of a tree at Marla much to the disgust of our youngest who thought we could take him home. Next morning we continued south to Coober Pedy to have a look at this interesting place, click HERE to find out more about this bizarre place! You know you are getting close when you come across these mounds. There is some serious mining for Opals here, it is also known as the opal mining capital of the world with over 70 opal fields. To me the unfortunate thing is it leaves the landscape looking like the above and below photo’s, interesting but quite ugly! There are a lot of houses here that are mostly underground or partially underground to escape the searing heat experienced here. You can see the ventilation shafts in the photo below. Here’s a panoramic view from the lookout. Time to move on. unfortunately we found Coober Pedy to be dirty, unappealing and creepy. Not a glowing endorsement considering plenty of other people find it amazing. I should also say that we didn’t do any of the underground mine tours or building tours, apparently these are quite good. We can recommend the Coober Pedy Outback Bar and Grill, we had a really great lunch! Time to hit the road again and get as far along as we could before it got dark. Another road photo, not really exciting. Lots of road to look at. Last night on the side of the road, plenty of firewood required for a nice warm fire! It was a cold windy night. We had one more night before we got home and we decided to book a house at a campground which was sort of nice not to have to unpack and set up the camper trailer, a last night of luxury. Sort of! I apologise for all the blurry/grainy photos above, they were all taken on a IPhone 5a, b or c, who would know…Well after 6500 kilometres and three weeks on the road, it was great to be home with a whole heap of memories and experiences which we shall never forget for all the right reasons! Now the fun starts…..Unpacking!! That’s just me with my family poking fun at me, never seemed to have the camera away from my eyes! Oh, and a small bald spot! Just in case you missed any of my posts on the Northern Territory, here is a recap for you with links to them. Part 1 – A long time ago now! Part 4 – National Road Transport Hall of Fame. Part 6 – Alice Springs, a few last glimpses. Part 13 – You’re already on it!! I will finish here with a tribute to the Northern Territory using lyrics from a hugely popular and loved classic of the screen and Broadway. I couldn’t have said it better!! A trip to the Northern Territory. Part 12b. Continuing our sojourn at Kata Tjuta, we next moved onto Walpa Gorge, a much shorter walk of about 1 hour return, this is a desert refuge for plants and animals as the soaring high walls shield the gorge from the hot sun. Notice above on the left hand side on top of the dome, plants in a very exposed situation, coping with all sorts of extreme weather. Walpa means windy and quite frequently you will get refreshing winds through here. Refreshing in winter time may mean “cold”. We didn’t see any animals in this gorge and one could imagine that with the hoards of tourists who come in here everyday, they would be quite selective with the times they would show themselves. The walls are virtually straight up and down! Not sure why I included this photo, just like how the water plays across the stony ground. This is actually a very small stream that was trickling across the pathway. Might be more apt to call it runoff. Just imagine its a high-resolution satellite image taken from high altitude of a flooded plain. Amazing what you can see in a picture! Look at the size of those people walking compared to the gorge walls! Here’s a few more water related shots. No doubt the native fauna enjoys these cool ponds. An interesting information panel above. Below you can see some of the Spearwood in flower(white dots on green foliage, if you squint). Well, we’ve reached the end of the track and officially our feet are now sore and tired after two days of a fair bit of walking, but we are at peace with the landscape and our minds are refreshed. Thanks Kata Tjuta, we may or may not ever see you again, but your features and form are forever indelibly inked in our minds. As we make our way back to camp for our last night in the Territory, we make one final stop at the beating heart of our great land. So long Uluru, it has been wonderful! A trip to the Northern Territory. Part 12a. The next day dawned bright and not a cloud in sight, a bit different from yesterdays weather at Uluru(see part 11). Todays adventure was being held at Kata Tjuta aka the Olga’s. 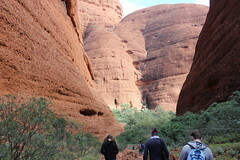 Another amazing landform not far from Uluru with rich cultural attachments for the local people. 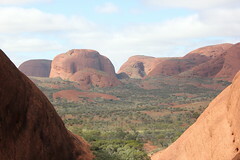 Kata Tjuta is Pitjantjatjara meaning ‘many heads’, clearly evident in the above photo how they got to that name! More formally you would describe it as an imposing series of mounds and domes that rise out of the surrounding landscape to an astonishing height of 546 metres above the plane(or 1066 metres above sea level). 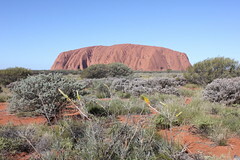 That’s a staggering 200 metres(roughly) taller than Uluru(Ayres Rock), yet I don’t think it is as well-known as Uluru. 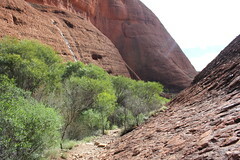 I suppose the difference is you can’t climb Kata Tjuta whereas you can Uluru occasionally! What is it with us white fella’s wanting to climb and stomp over everything anyway… I digress, there will be no more political leanings or thoughts from now on! As is the case with Uluru, these rock formations are just the tip of a huge slab of conglomerate that may extend up to 6 kilometres underground. What is conglomerate? I will get to that later! These two photos were taken from the dune viewing area where there were some interesting plants to check out as well, always a good thing. This is the Broad leaf Parakeelya, Calandrinia balonensis, an annual or perennial growing to 30cm either way with a basal rosette of fleshy linear to lanceolate leaves up to 10 cm long and 1 cm wide. A good indicator plant of recent good rain, if there’s a good number and they are of a good size-this indicates recent good rain as they grow rapidly during wet seasons and store water for the dry times. It has a small purple poppy like flower on tallish stems that dance around in the breeze, if there is one! Also from the dune viewing platform, you can swivel 90 degrees to the right and this is what you see below. The only other imposing rock that’s around here! The tree’s you see in the distance are Desert Oak, Allocasuarina decaisneana , also look at the first two photos of this post, the majority are all Desert Oak, quite common across the spinifex grasslands. Juvenile Desert Oak are quite different in appearance compared to mature examples. More will be revealed about these trees in a future post! Now lets head off and have a look at this place. Kata Tjuta is a Anangu mens site and sacred under traditional law, which means for us tourists there is no wandering off the pathways. There are plenty of different walks here and lots to see, so as we meander along, please stay with me! No wandering off! Note in the above photo the puddle of water which is a byproduct of rain we had here the day before. If you have read part 11 of this series you would realise this, but now we were enjoying the crisp sunshine, it is winter by the way! A balmy 17 degrees Celsius! You can see a bunch of people above, and to their left a green patch. I will concentrate on that now, the patch that is. massive boulders. Flowers May (late-autumn) and Aug.-Oct. (late-winter to mid-spring)”. Above we have a seepage area on a scree slope, which is where it likes to grow. Quite a sharp prickly grass, looks more shrub like though doesn’t it! Even closer below. This is a problem I find, I get distracted by things off to the side of the pathway and lo and behold the next time I look up the family is gone!! I’m sure I’ll catch them somewhere. The remarkable thing about Kata Tjuta is that it’s composed of a different type of rock than what Uluru(made of sandstone) is which is only 50 kilometres away(by road, 32 as the crow flies). Katu Tjuta is a conglomerate, a gravel consisting of pebbles, boulders and cobbles cemented by sand and mud. Conglomerate is also a sedimentary type rock. From a distance Kata Tjuta looks like the other big rock just around the corner, but up close its quite rough, see below photo. Don’t know why, but I found this quite fascinating. Here in the middle of no where, the only two objects that rise above the plain separated by a mere 50 kilometres are made of completely different rock. I’m sure this happens everywhere, but I just found it fascinating.. Click HERE for more geology information on this rock formation. If this was originally a huge slab of rock, how did it become domes and valleys? This is likely to be mechanical erosion of sand from the rock and other chemical erosion caused by moisture. The major Valley may have been fractured from the time of the Alice Springs Orogeny. Chemical weathering due to ground water widened the fissures and rainwater run off gradually formed the domes and canyons we now see. Now for some more wildflowers. Look at that patch of Pussytails, Ptilotis. Closer view here. This is actually Hairy Mulla Mulla, Ptilotus helipteroides . The stems and leaves have a persistent covering of medium to dense hairs, giving it its common name. 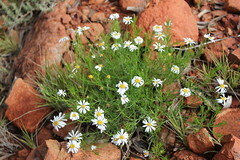 It is an annual herb growing to about 50cm and usually occurs on rocky or gravelly ranges, hills or rises and on acidic rock and also found in Mulga dominated red plains and other locations. Flowering from June until November, now for a real close-up! We were heading to the Valley of the Winds and eventually the Karingana lookout, a return trip of 2.5 hours on a grade 4 – difficult track according to the visitor guide. I think it was more in line with moderate track! Here we are well into the Valley of the Winds and yes it was slightly breezy here! It’s at this point in the above photo that if the temperature is over 36 deg Celsius at 11am, the track is closed. This is the Karu Lookout, impressive to say the last. Those mounds in the distance look like a flight of stairs, sort of! As you can see it is quite rocky here. Nothing amazing with the above photo, just showing more rock and more conglomerate, you can also see water seeping out from under that large slab. Below is a swathe of Hairy Mulla Mulla, quite impressive to see it like this in its natural environment. Again not a great photo but it just shows a lovely natural garden bed with no human influence! I read something recently which I hadn’t really thought of before and that was someone’s thought on grouping colours in the garden as we do, pastels here, bright hot colours over there and so on. The thought was (not exactly in these words)”Nature doesn’t separate plants into colour groupings, so I’m not going too. There is just a riot of colour throughout my garden”. I really liked that and it may just become my new mantra. Not sure what the old mantra was!! These plants I have no idea at the moment what they are, they are a work in progress. In the above photo we are nearing the Karingana Lookout. You can see it in the distance, the high part in between the two walls. The walls of the domes just seemed to rise and rise into the bright noon day sun. Well! We made it, what an amazing panorama greeted us! Time to sit down for a quick bite to eat. The 3 oldest boys decided they would keep going on the circuit walk and us oldies along with our youngest lad turned back here. Here they are heading off at breakneck speed as per normal! Below is another beautiful spot to recharge your batteries! Heading back to Karu Lookout. 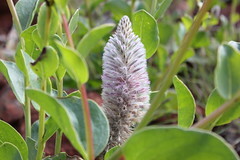 Below we have another Pussytail, Ptilotus exaltus , also known as Tall Mulla Mulla. 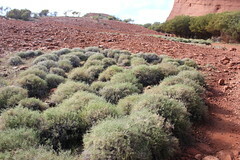 Grows to about 1.5 metres tall forming large showy drifts in open scrub and mulga country. The flowers start off cone shape then eventually lengthen to be elongated and cylindrical 3-20cm in length and 4.5cm in diameter. Compare the above two photos. The leaves are quite thick and rubbery looking, flowering from early spring until summer. Widespread across all mainland states. Here’s a small drift of them below. Another plant we saw was , Hakea subarea . This small tree also made an appearance at Ormiston Gorge. Click HERE if you can’t remember! Here’s a beautiful Eremophila as well. Quite possibly Eremophila latrobei . Some walls for perspective! Note the little pocket of green three-quarters of the way up. Plants Hey! Amazing. More tall walls, this one below includes small people, well not small people, just normal ones! This is a small person one though! He’s also carrying a firearm( a gun I was told!). Here are some more flowering meadows(for want of a better word) which were good to see. Oops! forgot about this little fellow. sorry! This plant below is Cattle bush or Camel bush. Yet again you see the need for scientific names!! Two common names for the same plant, not confusing at all! It is actually Trichodesma zeylanicum . A perennial plant growing to 1 metre occurring on rocky hills and sand dunes, stony alluvial soils or areas subjected to seasonal flooding, flowering in winter and spring. It was originally eaten by camels in the outback, hence one of its common names. One presumes then that cattle also ate or still eat it! Summer forage option! Here’s a few more random plant photos! Here’s one last plant I noticed when we had nearly finished the Valley of the Winds Circuit walk. I walked right past this on the way in! Go figure. Obviously a Brachyscome of some description, beautiful anyway. A nice sculpture below. The dead tree that is. Now we are nearly back to the start of this circuit walk. We did another small walk after this one but I will cover that next time round, i.e. part 12b! 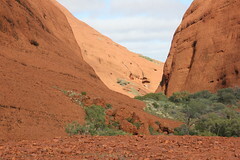 To finish off, I have added the below photos sans words as a parting gesture to the Valley of the Winds at Kata Tjuta. They speak for themselves!